Shroyer, T. (2017). 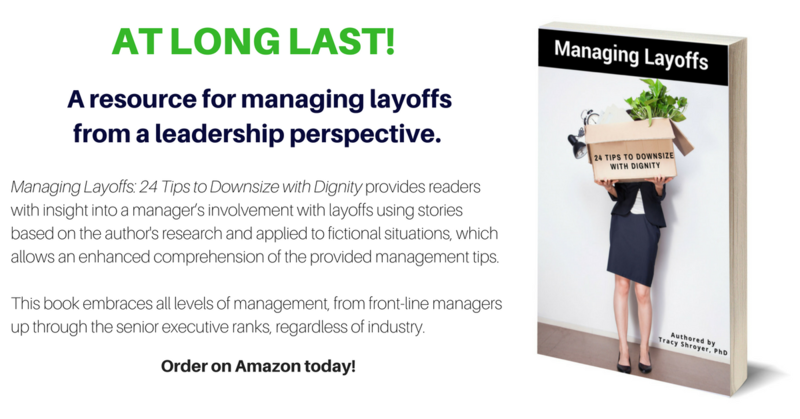 Managing Layoffs: 24 Tips to Downsize with Dignity. CreateSpace. 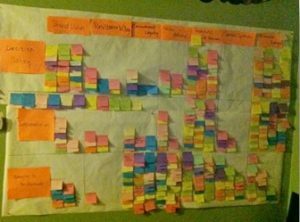 This qualitative exploratory inquiry examined the personal and professional experiences of downsizing managers during decision making, implementation, and managing in the aftermath of downsizing. Existing literature related to managing organizational change, decision making, and downsizing did not yet address managerial experience of downsizing or the personal and professional experiences of downsizing managers. In-depth interviews were conducted with 14 purposefully selected participants drawn from a population of (a) downsizing managers as defined in the study; (b) living within the United States; (c) in their current or prior organization during the last 10 years, so that participants’ memories will be fresh; the downsizing experience must have occurred at least 3 months prior to recruiting to ensure participants are not still in the midst of the process or related trauma; and (d) not known by or employed at the same organization as the researcher to prevent researcher bias, avoid existing relationships, and maintain participant privacy and confidentiality. The study findings indicate that downsizing managers face numerous personal and professional impacts because of the challenges and successes faced in their role as a downsizing manager during decision making, implementation, and managing in the aftermath of downsizing. In addition, downsizing managers had experiences that aligned with existing themes in the downsizing literature, and one newly identified theme, treating downsized employees humanely. Executive management teams should consider opportunities to provide insight, structure, support, and time to downsizing managers, as these elements may minimize the challenges that downsizing managers experience. Recommendations for future research include further study in organizations that utilize formal downsizing training programs for their management teams, a similar design study focusing on outsourced consultants who implement downsizings for organizations, and further exploration of managers’ humane treatment of employees during organizational change.